Another superhero, another costume controversy. 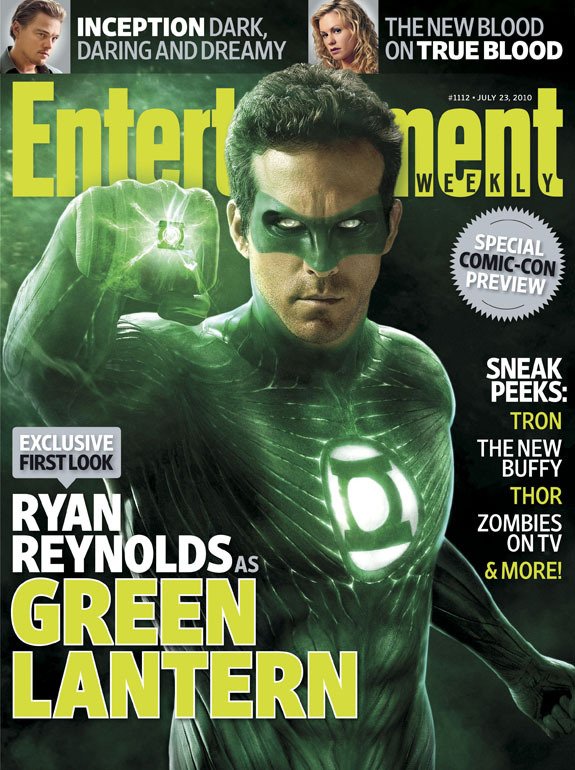 Images from Entertainment Weekly of Ryan Reynolds in his CGI Green Lantern costume for the forthcoming Martin Campbell movie adaptation have hit the Internet thanks to sites like iFanboy and MTV Splash Page. My initial reaction: I hate the ringslinger’s uniform! Upon further reflection, I loathe it. I want the costume to die in a fire because it is way too different from the hero’s classic look. In my book, this qualifies as a completely different, brand-new uniform. One that belongs on a GL from some other sector, not Earth’s 2814; it is simply too alien-looking. Are those textured ridges supposed to mimic musculature? Why? Looking at the giant GL logo on the chest, it appears to me that the designer was trying to say, “See the logo, guys? Maybe nothing else looks the way it should, but this guy is Green Lantern because he’s got the frakkin’ logo! Oh, and because he’s green.” Yeah, he is green. All over. We cannot see the entire costume, but it appears to be completely green, with no black elements and no white gloves. The mask doesn’t even look like it’s actually on his face — which it apparently isn’t, since it’s a CGI element. The mask looks like graffiti on his mug. And giving GL pupils looks like an ill-fated attempt to make him appear blind. Unlike the recent Wonder Woman costume change, this radical redesign has only one positive element: the look of the ring is….not bad. In fact, I think I kind of like it. But I am still left with the question: Why did the filmmakers settle on this radically altered design? It looks nothing like the character from the comics! 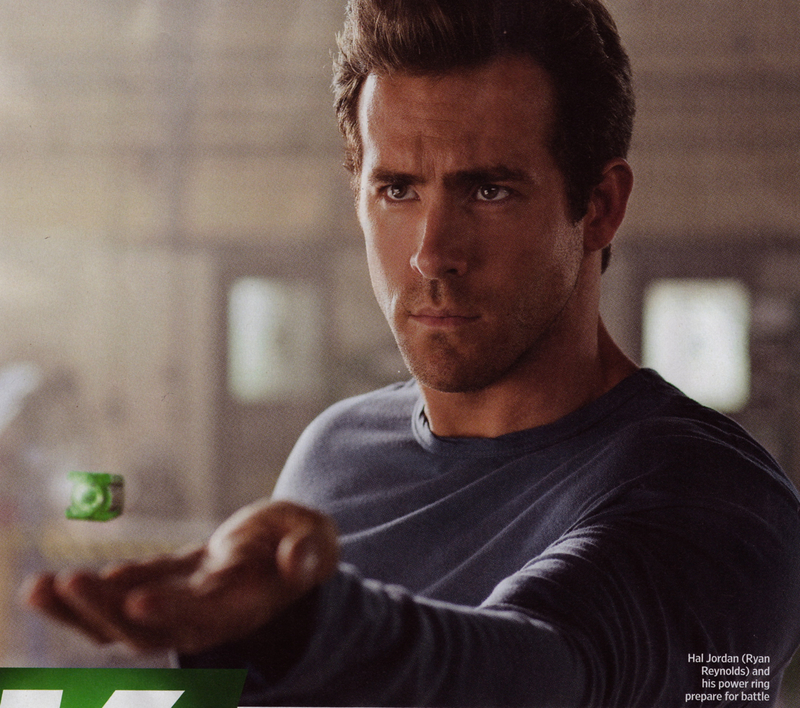 Could it be that director Campbell simply wants his film version of Hal Jordan to stand alone? Something else to keep in mind: unlike Wonder Woman’s doubtless-temporary wardrobe change in the comics, this movie version of the character will live forever. It will always be out there…disappointing me. The best thing I can say about it is, it’s different… but it does not suit him! This entry was posted in Comic Books, Film and tagged Comic books, DC Comics, Green Lantern, Green Lantern movie, Hal Jordan, Martin Campbell, Ryan Reynolds, Wonder Woman. Bookmark the permalink.